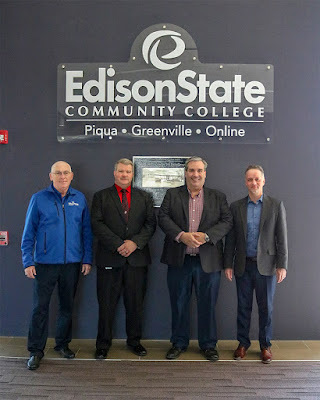 Manager; and Chris Spradlin, Edison State Provost. Edison State Community College and Nidec Press & Automation in Minster (Nidec Minster) have partnered to develop a pathway to facilitate the awarding of academic credits by Edison State for technical training conducted by Nidec Minster. The new pathway will create a seamless transition to the next step in education for Nidec Minster employees to obtain an Associate of Technical Study (ATS) degree with a major one of three pathways; Mechanical Design, Electro-Mechanical Engineering Technology, or Advanced Manufacturing Systems. For more information about the degree pathways, call 937.778.8600 and ask to speak with a resource specialist.